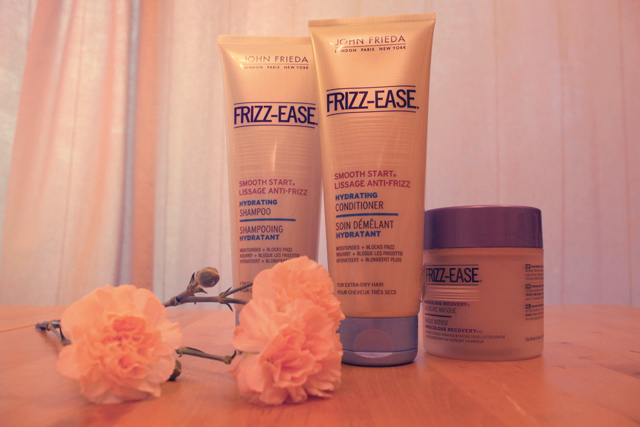 I was recently contacted to see if I wanted to try some items from the John Frieda haircare range. I’ve used both their Sheer Blonde and Full Repair ranges in the past and found both to be good (especially the Full Repair Deep Conditioner) so I was looking forward to see what would pop through my letterbox. I was quite excited when it turned out to be Frizz Ease. I remember my Mum having the hair serum about ten years ago and I must admit I haven’t used anything from this range since sneaking it out of her dressing table cupboard (sorry Mum!) all those years ago. My hair definitely suffers from a good bout of ‘frizz’ however – it’s naturally extremely thick and wavy and I have lots of frizzy, flyaway hairs that increase in volume when I straighten my hair. So I was looking forward to trying these products and seeing if they could cure me of the dreaded frizz! As you might know from my post about ‘The best purple shampoo‘ I use a purple toning shampoo every other wash to banish the yellowness from bleaching my hair so there was definitely space in my life for a new ‘every other wash’ shampoo, particularly as I’m going swimming a few nights a week which is meaning increased hairwashing. I duly packed the shampoo and conditioner in my gym bag and took them for a trip to the spa on Monday. The shampoo lathered up nicely and left my hair feeling clean and refreshed (it also smelt yummy!) I was also immensely impressed with the conditioner. I’m not a haircare snob but I tend to buy more expensive haircare treatments and deep conditioning masks and am forever spending 15 minutes with my feet up in the tub waiting for a treatment to do magic on my hair and make it soft and nourished. After only leaving this in for a few minutes in the showers at the spa my hair felt really well conditioned and was really silky and smooth when I blowdried it. I’ll be using the Masque over the next few days but if it’s as deep conditioning as the normal conditioner I have a feeling I’ll be impressed. Overall I’ll definitely pick these products up again and they will be a regular addition in my gym bag. If you’re looking for a shampoo and conditioner that’ll tame and smooth flyaway hairs without breaking the bank then this is the one for you. Next on my list to try is the 3 Day Straight styling spray – since I’m giving my face a break by not wearing as much make-up at the moment it makes sense to try and give my hair a bit of a break too so I love the idea of 3-day straight hair! Has anyone tried it?